Was checking out mentions of "These Come From Trees" on Twitter today (here's the search I was using), and lo and behold, saw this great TwitPic post by Justin Küblbeck of Germany. Apparently some enterprising person in Germany posted these about...including on a toilet paper dispenser. That's commitment! Wow. We don't do as good a job as we could in documenting the international locales that TCFT stickers end up at, but suffice it to say, roughly 15% of sticker purchases are from outside the US, even non-english speaking countries. We haven't had anyone localize These Come From Trees stickers into German, like they have been for Italian and Arabic, but if anyone would like to, let us know, and we're happy to provide the Photoshop originals! I've never been to Alaska, though I very much want to go. There's something really attractive about the wild beauty of the last true frontier of the US. In the meantime, though, it seems that I can take some pride in the fact that a whole passel of These Come From Trees stickers will be making their way up to the University of Alaska Fairbanks. UAF already has a large Go Green Initiative, complete with its own website. When the head of dining services at the University saw a TCFT sticker up in a bathroom in his local coffee shop (posted, no doubt, by a guerrilla TCFT participant! ), he ended up back on this blog, where he was able to read up on the the long (and growing!) list of Universities (and businesses, and K-12 schools!) deploying TCFT stickers. 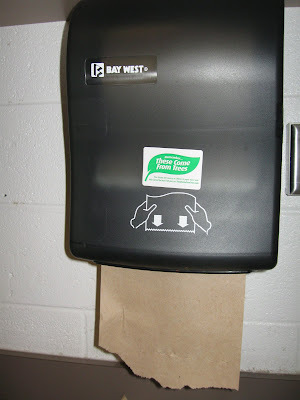 He sent an email to the head of facilities for the whole University, and just like that, UAF will be posting TCFT stickers on all of their paper towel dispensers, throughout the University. How cool is that? Talk about a perfect case study of how "It only takes one"--a single sticker in the right place, in front of the right person can totally blow things wide open! When I finally make it up to Alaska, it'll make me happy to know that TCFT is already thriving up there in the great white north. I've been trying to do a better job of posting examples of These Come From Trees being used in the wild, whether by individuals, companies, or higher education institutions. One big success story that I've been remiss in noting has been West Virginia University. They were one of the earlier examples of a higher ed organization making a concerted effort to deploy stickers across their entire campus, and I want to recognize their efforts! Barbara Angeletti, a facilities coordinator at West Virgina University, was tipped off by some stickers she saw up around campus, doubtless posted by an enterprising student doing his part. She started off picking up 200 stickers to deploy, and keeps coming back for more, currently up to 1200 stickers across campus. Barbara noted to us that this is just one part of their larger initiative to green the campus, and that they're tracking things to see what sort of impact their various programs make. We'll be looking forward to hearing more about it! Tulane Medical School out in New Orleans, Louisiana is doing their part to save trees while saving lives. Niels Olson, class of 2009, bought up a couple hundred These Come From Trees stickers for use at the medical school, and has reported that they've been gladly welcomed onto campus, and even better, match nicely with the green of the University's logo. Great fit! They join dozens of other institutes of higher education like Stanford, and others in helping students, faculty, and staff to pause for a second and consider the resource they're about to consume. Read more about other organizations, from companies to K-12 schools, and, of course, lots of individuals, who are spreading the word! I like to keep an eye on which organizations show up in the TCFT inbox, and the other day, one that's near and dear to my heart showed up. The Stanford Blood Center is a subsidiary of Stanford Medical School, and has a couple locations around Palo Alto. It's also where I give blood as often as my schedule allows (every 8 weeks or so). I like to do apheresis, where they pull your blood out, run it through a centrifuge to filter out plasma and platelets, which are retained, and then return your red blood cells. The plasma and platelets are really important for burn victims, folks with immune problems, newborns, etc. One reason why I really like apheresis, is that even though it takes longer (an hour and a half), you get more "bang for your buck" than just donating a pint of whole blood (30 minutes), because an hour's worth of aphersis can result in something like 10x the amount of "blood product" as a pint of whole blood. As folks who are familiar with These Come From Trees, I'm a fan of technology that force-multiplies individual effort. And plus, I just sit there doing email one-handed on the free wifi they provide at the Blood Center, and time flies! They have a location that's right down the street from VMware, so it's a slam dunk for me. Anyway, I digrees. Michelle Harmon, a staffer at the Blood Center, recently ran across a TCFT sticker in the ladies' room at the Tied House Brewery in downtown San Jose. She liked the sticker, remembered the TheseComeFromTress.com domain, and ended up on the blog, where she read all about, and loved what she saw. So she ended up ordering 200 stickers for deploying across their three locations to help make the Blood Center a greener place. How's that for a happy ending? The other day I blogged about how someone had noticed that there were These Come From Trees stickers up in the Boston Logan Airport bathrooms. What I hadn't realized that the person who blogged it, Tamara Krinsky, had her own initiative she was popularizing: "Change the Margins" or a campaign to mildly expand the default margins on Microsoft Word documents to marginally reduce the use of paper. And Tamara's campaign has gotten some great publicity, as has her blog, which helped These Come From Trees when she blogged about the project. But what's especially fascinating to me, is that this kind of serendipity, the fact that some nameless These Come From Trees enthusiast out in Boston took the initiative, and as a result, Tamara Krinsky saw it, and spread it with her platform. This is what's so inspiring to me: while I blog here and there about organizations that are picking up thousands of stickers to deploy in their bathrooms, it's the individual These Come From Trees team members out there, spreading the stickers onesie, twosie across the the world who are doing the amazing work. You never know when that one sticker you put up in Starbucks, or your favorite restaurant, will be read by the Director of Facilities of some Fortune 500 company, or a reporter, or someone with the power to broadcast the message louder and and broader than ever. NVIDIA makes the fastest, baddest, raddest graphics processors on the market. They're the ones responsible for making games and 3D on your computer look realistic and, most important, FAST! In fact, when Apple started including NVIDIA graphics chips in more and more of their Macs in October, it made my day job as VMware Fusion's lead evangelist a lot more interesting. So it was particularly exciting back in December to see the name NVIDIA in the These Come From Trees inbox. Sure enough, NVIDIA's facilities department is always looking for ways of reducing their waste consumption, and were tipped off via an employee suggestion box, and some "rogue" stickers that had started going up in the campus bathrooms by unnamed contributors. Thank you, anonyous NVIDIA employees! I checked in with them the other day, and sure enough, they've deployed all 200 stickers that they purchased across 12 buildings on NVIDIA's campus. They join the ranks of other technology companies like SanDisk, Eloqua, Yahoo, Google, eBay and others using These Come From Trees on their campus. You can read about other companies using These Come From Trees stickers here. The San Jose Tech Museum of Innovation is this wonderful museum in downtown San Jose that chronicles the history of all things technology. It turns out that they are having an Earth Week celebration that focuses on Green Technology coming up in early April, in honor of Earth Day. As part of this, they're looking at ways to use green technology to help green up the museum. 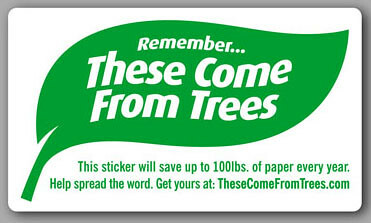 Apparently this also includes the relatively low-technology of These Come From Trees stickers, which they just purchased 200 of to post in all their bathrooms! The curriculum organizer became familiar with TCFT stickers through seeing them posted up around her community in coffee shops and restaurants, from some unnamed TCFT participant. Like we always say: it only takes one! Although, truth be told, These Come From Trees stickers are a fun, effective, mix of low and high technology. Low technology, in that the sticker is simply printing, language, and images. High technology, in that there is a call to action on the stickers to "Spread the word! Get yours at TheseComeFromTrees.com", which points folks back to this blog. We actually see how much traffic comes to this blog via people typing in "TheseComeFromTrees.com" and also Googling for "These Come From Trees" or "These Come From Trees Stickers" and it's quite a bit! So clearly that part of the sticker is working! Once on this blog (high technology, itself! ), they can read all about the project, how it came to be, and how not only individuals are engaged, but also hundreds of companies who are deploying These Come From Trees stickers at their own offices. Add to that the fact that we can take online Paypal payments to make it easy for the community to fund this program, with little to no human involvement (we didn't have to get any grants to get this off the ground: the participants funded it! ), and you've got quite a bit of technology being used to force-multiply a single idea into something much larger. So I suppose the TCFT stickers at the Tech Museum will be both functional AND an exhibit in themselves! A little less than a year ago, I blogged about how Clorox had purchased 300 These Come From Trees stickers for deploying at their Oakland, California campus. At the time, the gentleman in charge of the program noted that this was a "pilot project" to see how it worked, and that if they were happy with it, they would look to expand the program to other Clorox locations outside of Oakland. I was very pleased the other day when I saw another Clorox order for 400 TCFT stickers sitting in the TCFT inbox. It looks like the program is moving ahead nicely! Clorox was one of the first companies that we blogged about deploying These Come From Trees stickers, and since then, hundreds of companies (not to mention thousands of individual guerrilla stickerers) have purchased These Come From Trees stickers for use in their own offices. As most folks know, Clorox is a chemical company, and those typically aren't looked at as very "green." 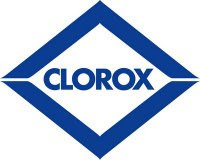 However, Clorox looks like it's making strides, both in terms of greening their corporate campus through programs like These Come From Trees, and even through their own product mix, like the relatively new "Green Works" line of products that are positioned as lower impact on the environment. I got the most wonderful note the other day from Jon McConnell of Stanford University's Haas Center for Public Service. It turns out that an enterprising student who had seen guerrilla stickers up around Palo Alto, and here and there in some dorms around Stanford, applied for a mini-grant from the Haas Center to purchase and deploy These Come From Trees stickers across the Stanford campus. That student and others will be working to deploy These Come From Trees stickers in bathrooms all across campus, from the dorms to the lecture halls to libraries and more. They ordered 1200 to start off. Next time I'm back on the Farm, I'll be looking forward to seeing TCFT stickers up and about! Stanford joins a whole host of other organizations deploying These Come From Trees stickers broadly, like Clorox, SanDisk, Palo Alto Medical Foundation, and many more.